A homily given at the Basilica of the National Shrine of the Immaculate Conception for the Solemnity of the Immaculate Conception and the dedication of the basilica’s Trinity Dome. It was given on Thursday, December 8, 2017. ENGRAVED IN THE stone façade of this great basilica are the words that speak of the devotion and pride that bring us to this Mass and celebration today: “Thou art the glory of Jerusalem, the joy of Israel and the honor of your people.” That exclamation, taken from the Book of Judith (15:9), has long been applied to the Blessed Virgin Mary. In a rich patristic and devotional tradition, it is Mary who is recognized as the glory, joy and honor of God’s holy people. Directly under that proclamation is the image of the Angel Gabriel announcing to Mary the reason why she was to become our honor, joy and glory. Here also is the greeting carved in stone and proclaimed in the Gospel for today, “Hail Mary, full of grace, the Lord is with thee.” In those words that are so familiar in the heart and on the lips of every Catholic, we also announce that Mary is blessed among all women because of the fruit of her womb, Jesus. What we today celebrate, dedicate and consign to the ages to come is the completion of the basilica represented in the adornment of the entire interior of the great dome with millions of pieces of colored tile culminating in the presentation of Mary with the title of her Immaculate Conception under the radiant image of the Triune God, Father, Son, and Holy Spirit. TODAY’S BLESSING of the Trinity Dome completes a work that was began nearly 100 years ago. On September 20, 1918, on the very spot where this basilica now stands, Cardinal James Gibbons of Baltimore announced, “Let us, too, offer to the world an example of Catholic gratitude, faith and love by erecting at Washington the National Shrine of the Immaculate Conception at whose altars your children and your children’s children will be proud to pray and worship.” Two years later, on September 20, 1920, Cardinal Gibbons laid the cornerstone. As plans developed for the building of the National Shrine, people were invited to contribute in whatever manner they found appropriate. Among the gifts were donated pieces of gold jewelry and even some precious stones. These were fashioned into what came to be known as the “First Chalice of the National Shrine.” My brothers and sisters, I am happy to say that the chalice at this Mass is the “First Chalice of the National Shrine” that was used for the first time 100 years ago today. In 1953, the bishops conducted a nationwide appeal for funds with which to erect the great superstructure of the National Shrine. Work began in the summer of 1955 and was completed for the dedication of the Great Upper Church, November 20, 1959. At that time, the interior of this magnificent basilica, measuring over 450 feet in length and 239 feet to the top of the cross of the dome, was adorned with only one mosaic, the depiction by John de Rosen of “Christ in Majesty” which fills the wall of the north apse. Some months ago, Monsignor Walter Rossi, the Rector of the Shrine who has overseen the work that now stands before us completed, and I, were honored to put in place the mosaic rendering of those words blessed by Pope Francis. In them, we can all also say, “Amen” to the vision of a century ago. As you gaze up at this modern-day masterpiece, around the base of the dome you can see the words of the Creed that we all profess on our lips and in our hearts. Now it is also proclaimed in glorious mosaic. Look carefully, and you will also see the likeness of saints who have had either a special tie to our country or a link to this Shrine. Among them are Saint Pope John Paul II who named it a basilica, Blessed Pope Paul VI who presented the Shrine with his papal coronation tiara and, of course, Saint Pope John XXIII. It was this pope who sent a special message for the blessing in 1959 of the Great Upper Church. Today, his successor Pope Francis has honored us with a papal message for this sacred occasion and a special messenger to bring it. His Eminence Cardinal Kevin Farrell, head of the Vatican Dicastery for Laity, Family, and Life, is here as the Pope’s Envoy. Cardinal Farrell has a personal tie to the National Shrine since it was here in 2002 that he was ordained a bishop. We look forward to his message from our Holy Father, Pope Francis. INSPIRATION FOR the shrine and therefore this dome may be said to go back to 1846 when a score of bishops assembled in the 6th Council of Baltimore chose the Blessed Virgin Mary to be the patroness of the United States under the title of her Immaculate Conception. This very basilica is a splendid example of Catholic devotion to Mary. 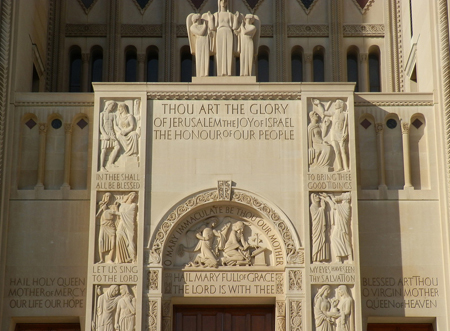 What prompted the bishops, clergy, religious, and laity of the Church in the United States to make the sacrifices that resulted in this temple dedicated to the glory of God and honor of God’s holy Mother? 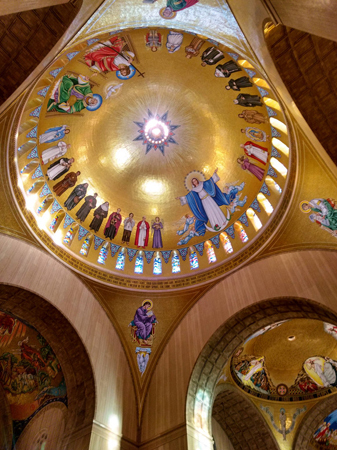 What motivated so many of the Catholic faithful encouraged by the request of their bishops to complete the work of this great central dome culminating in the artistic representation of the Most Holy Trinity and Mary the Immaculate Conception? Mary is the model of what our faith should be. Like us, Mary was a human being who had to be open to hear and accept God’s word and to grasp the mysterious ways in which God works. She did so with such consummate fidelity that she is forever the example of what we mean by faith — true, profound faith. On this day, as the Church recognizes the Solemnity of the Immaculate Conception of the Blessed Virgin Mary, patronal feast day of the United States of America, we pause, once again, to hear God’s Word, to have our hearts and minds elevated by the beauty of what we are about to bless and to thank God for the invitation to walk in His way revealed to us in the Gospel of Jesus Christ, God and Man. THE ULTIMATE goal of every follower of Christ is to become, as closely as we can, one with Christ in a way that we participate in the new life He offers us through an outpouring of the Holy Spirit. It was God’s Providential design that His own Eternal Word would come among us, take on flesh and be born as a human being. The human nature through Mary and the divine nature through the power of the Holy Spirit by which Mary conceived are united in the fruit of her womb, the person Jesus who is God and man. Anything else we say about Mary will always refer back to the fact that she is the Immaculately Conceived Mother of God. Here we hear echoes from the first reading for today from the Book of Genesis. The Church has long reflected on Mary as the New Eve. This was to be the beginning of a new covenant bringing together all people into one new Body — the Body of Christ — the Church. My brothers and sisters, when we look at this great Trinity Dome and see the myriad tiles in so much color coming together to realize this extraordinary work of art, we are reminded that here in the pews of this National Shrine, our nation’s Marian House, we see a similar phenomenon this time in living stone — the living members who make up the Body of Christ. On any given Sunday or Solemnity, such as today, all we have to do is look out across the thousands of people gathered for Mass and we see the face of the world. Just as there are chapels throughout this Basilica reflecting national heritages, ethnic backgrounds, all proclaiming in unison “Hail Mary” so, too, do we look across this great Church of God and see out of so many one great faith family. We have come to be one in proclamation of faith, experience of redemption in the Eucharist and communion as one Church in God’s Holy Spirit.